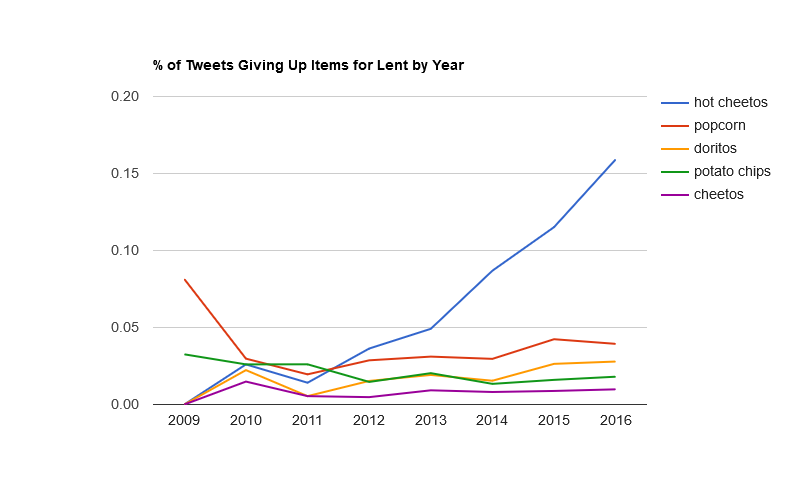 This year, more people are giving up chocolate than anything else; last year’s favorite, school, dropped four places to #5. Several were topical: TOPS came in at #40, referring to Louisiana’s discontinuation of the college scholarship program of that name. Presidential candidate Donald Trump came in at #82, while “running for president” came in at #84, referring to the withdrawal of candidates Chris Christie and Carly Fiorina from the race after disappointing results in New Hampshire. “Politics” came in at #91. Big gainers this year are “indifference,” at #51, and “being petty” at #59. 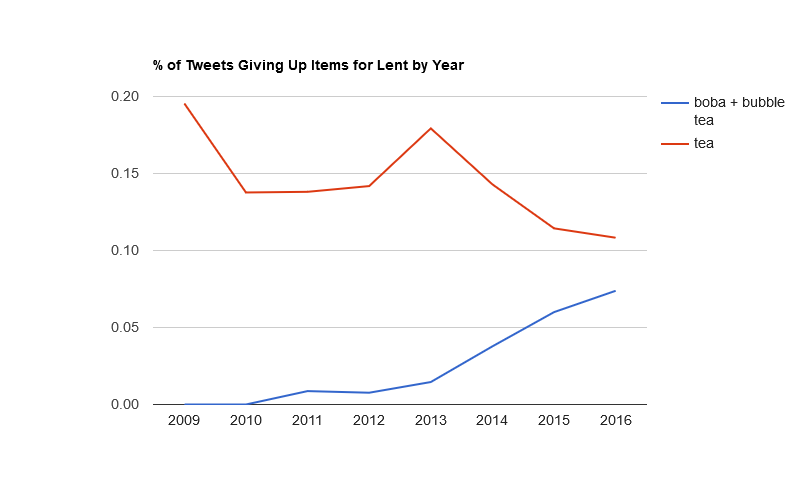 The former follows Pope Francis’s Lent message from last year, which a few media outlets picked up this year. 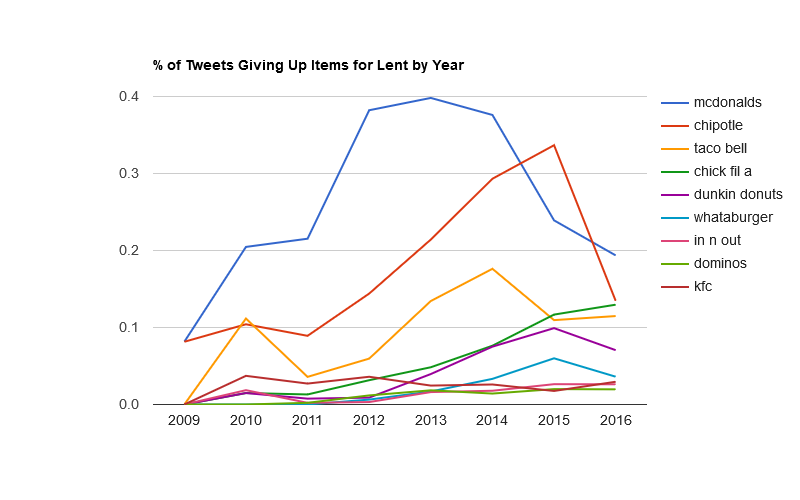 The total number of tweets, around 200,000 (with the 60,000 non-retweets specifically mentioning giving up something serving as the basis for this analysis), dropped in half from last year’s total. I don’t know whether people are using Twitter less or if Twitter is throttling the data available in their API. Either way, much less data is available this year than last. Snapchat passes Instagram for the first time this year. WhatsApp continues to rank surprisingly low given its popularity. Chipotle’s well-publicized food-safety woes reversed its trajectory this year. Hot Cheetos show no signs of slowing down. Boba, or bubble tea, is the new beverage of choice, apparently. 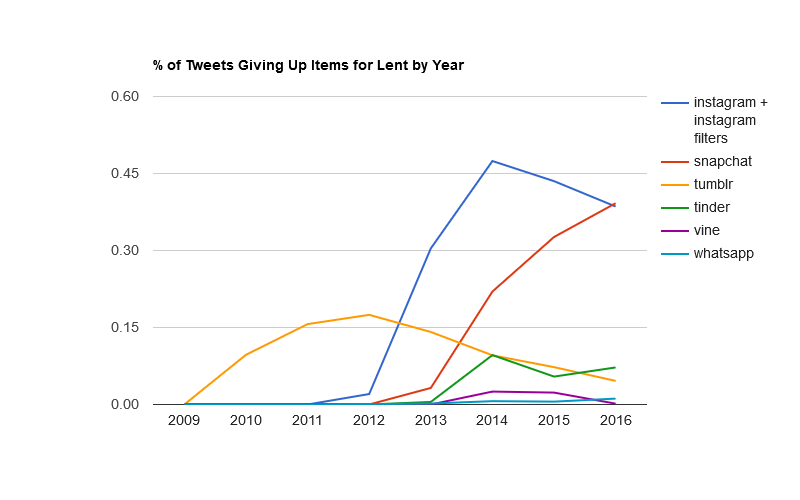 This entry was posted on Saturday, February 13th, 2016 at 11:44 pm	and is filed under Lent. You can follow any responses to this entry through the RSS 2.0 feed. Both comments and pings are currently closed.